Yes, you’ve read correctly. Your very own TARIFA has a girlfriend, and she’s rather… attractive. Her name is Bay May Name Swimsuit and it’s the new collection of female swimsuits by Bruna Malucelli. Looking at her models, it’s clear we make a great couple. Don’t you think? 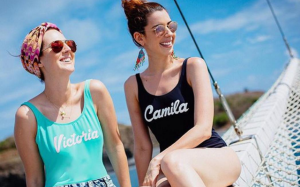 Similar to TARIFA, their swimsuits are available in multiple colors, and they’ve been designed with materials of the best quality, which are of course, customizable. Without a doubt, the best option for those who want to share their most glamorous and femenine side. One of the famous faces that have worn a model from Bruna Malucelli’s collection has been Bella Hadid. The more than 250.000 likes in her post are a good show that the look is a hit. She is likely not to be the last one to make a splash on social media, as this brand has arrived to take a spot in the wardrobe on every top model. The reason… is clear. Their name is Allwelove, it’s Spanish and models such as Elle Macpherson, Monaco’s Princess Charlenne, Carolina Herrera or Naomi Campbell have turned this handbag into a fashion icon. Everyone wants one. Not strange, given this exclusive brand focuses en comfort, simplicity and sophistication in every one of their models. They have been such a hit, in their barely two year existence, that more than 2.000 units have been sold. A high number given that each model is only made in 15 or 20 similar designs. Their secret? They are manufactured using natural materials such as linen, cotto, suede or leather… And always with attractive colors and a touch of neon in the zippers. To make them even more exclusive, Allwelove allows you to customize each handbag with your initials, a logo or a seal. 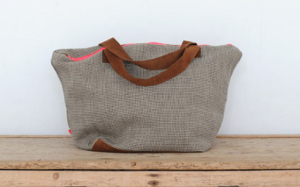 They also design luggage, weekend bags or dressing cases. We think they are great, what about you? An icon on the beach. Born in the beaches of Rio de Janeiro. Since 1962, Havaianas have carried millions of feet worldwide across the world. They are comfortable, resistant, and one can choose among thousands of designs. These are only some of the reasons to combine them with your TARIFAs in 2016. From its flip-flops, espadrilles or sneakers, you are bound to find a pair that is the perfect fit. The Havaianas family grows every year with something in common: the latest style. If you are bound to be wearing flip-flops, they might as well be Havaianas. Take a look at their new collection and create a unique and personal look combining them with your TARIFAs. Don't miss out on the latest on men's swimwear, customization, luxury destinations and the good life on our TARIFA and COMPANY blog.